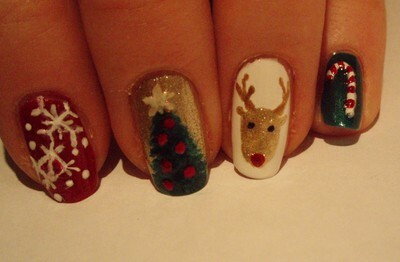 Advent Sunday today I thought I would do a simple manicure with a slight Christmas feeling to it. 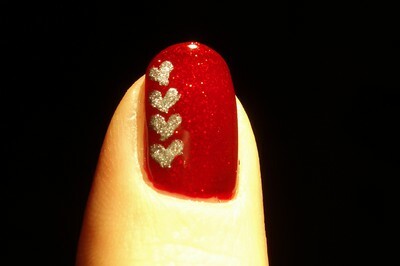 The base is China Glaze Ruby Pumps, and the hearts are painted with Y.S.S.Y #6 using a small art brush. I know that it is very early for at Christmas design, but I have a good reason! 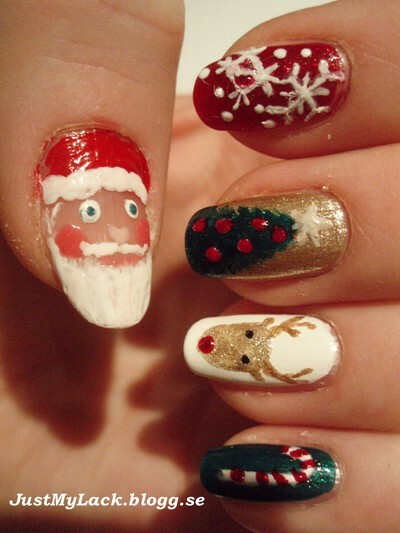 Tara who runs the nail blog For Your Nails Only is having a holiday nail art contest that I entered. I would really appreciate it if you wanted to vote for me here. 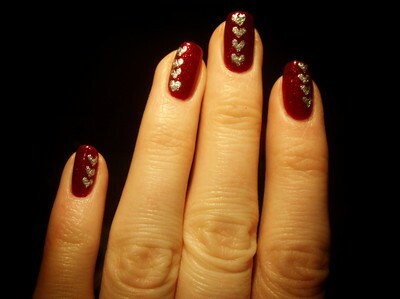 Index finger: China Glaze Ruby Pumps as a base Alix Avien as the snowflakes. Long finger: She Nail Sugar 504 as a base Emerald green as the Christmas tree, Alix Avien 60 mixed with She nail sugar 504 as the star and Ruby Pumps as the Christmas ornaments. Pinkie: Barry M Emerald Green as the base, Alix Avien60 and Ruby Pumps for the candy cane. 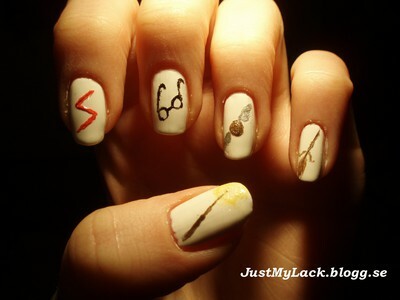 Here is the next Harry Potter manicure, inspired by the main character himself! Base coat: Alix Avien 60. Wand, Golden Snitch and broomstick: Gosh Iron mixed with Mavala 48 Black. The Wings of the Snitch: Y.S.S.Y 6. The scar: Flormar 321 mixed with Alix Avien 60. The glowing Wand: Viva La Diva cheesecake. Glasses: Flormar super shine 40. I am a huge Harry Potter Geek and since the premier of Harry Potter and the Deathly Hallows is on Wednesday I will be painting some Harry Potter inspired nails this week! 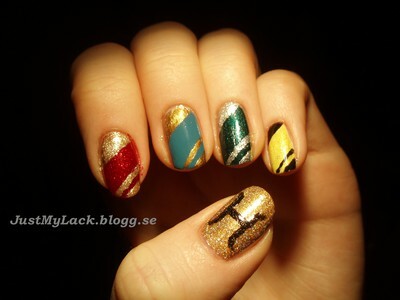 Today’s nails were inspired by the Hogwarts houses. 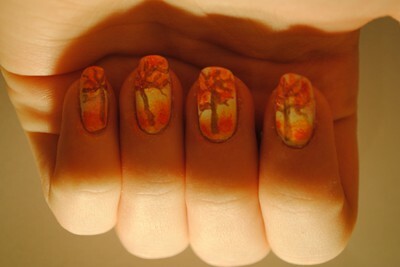 Thumb: Alix Avien 167 and Flormar (turn to page) 394! 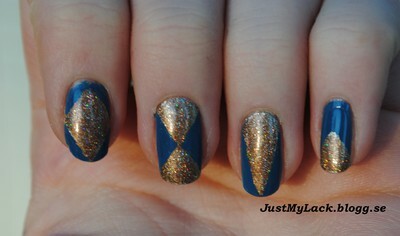 Blue Sky is a truly amazing polish, it is extremely opaque and you could get away with only using one coat. 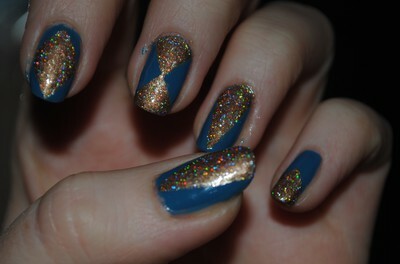 I doesn’t chip easily and it is very smooth and shiny so you don’t really need to have a top coat. Flormar 394 is a gorgeous gold/bronze holographic polish. It is very hard to capture, but the second picture shows the sparkle pretty accurately . My camera problem is finally solved! 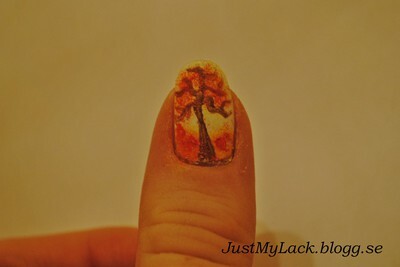 Here are the photos of the updated tree manicure from last week. I used a make-up sponge to apply the yellow, red and orange polishes. The yellow polish is Viva la Diva 17 Cheesecake, the red is FlorMar 236 and the orange is a mix of the two polishes.